Registration for this event begins at 10:30am. Dr. Epstein received his DVM from University of Georgia and is the Senior Partner and Medical Director ofTotalBond Veterinary Hospitals and Carolinas Animal Pain Management, a small group of AAHA­ accredited practices in the Charlotte & Gastonia NC area. He is a Diplomate of the American Board of Veterinary Practitioners (Canine/Feline) and is a past-president of ABVP. 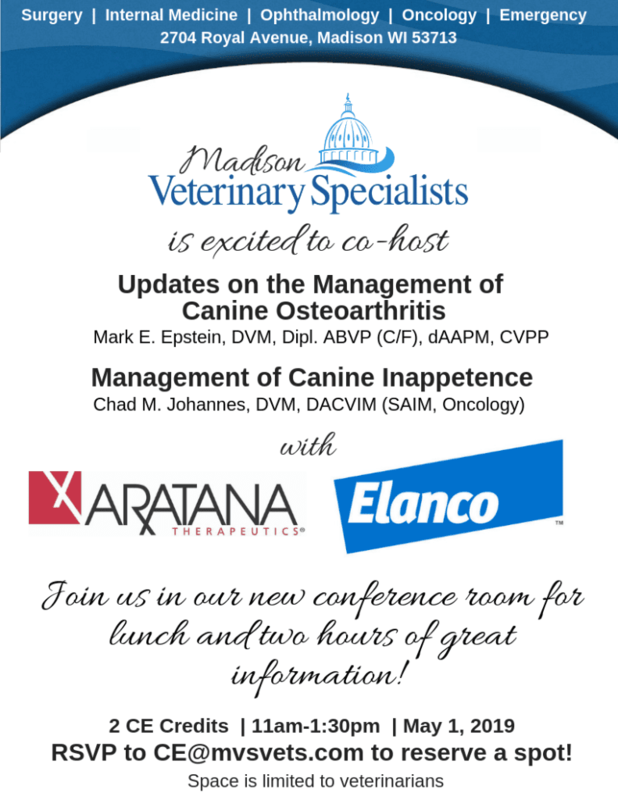 He is certified by the American Academy of Pain Management, is recognized as a Certified Veterinary Pain Practitioner by the International Veterinary Academy of Pain Management, and is a past-president of IVAPM. Dr. Epstein chaired the AAHA Senior Care Guidelines Task Force and co-Chaired the 2015 AAHA/AAFP Pain Management Guidelines Task Force. He, is published in journals* and textbooks,** and is a national and international lecturer on the recognition, prevention, and treatment of pain in the veterinary clinical setting. Chad M. Johannes, DVM, DACVIM (SAIM, Oncology) is Assistant Professor of Small Animal Internal Medicine and Oncology at Iowa State University. Dr. Johannes’s diverse background includes practice experience in primary care, specialty care and academic settings along with 6 years in industry at Pfizer Animal Health and Aratana Therapeutics. His areas of research interest include oncology therapeutic development, immunotherapeutics and effective management of treatment-related side effects. 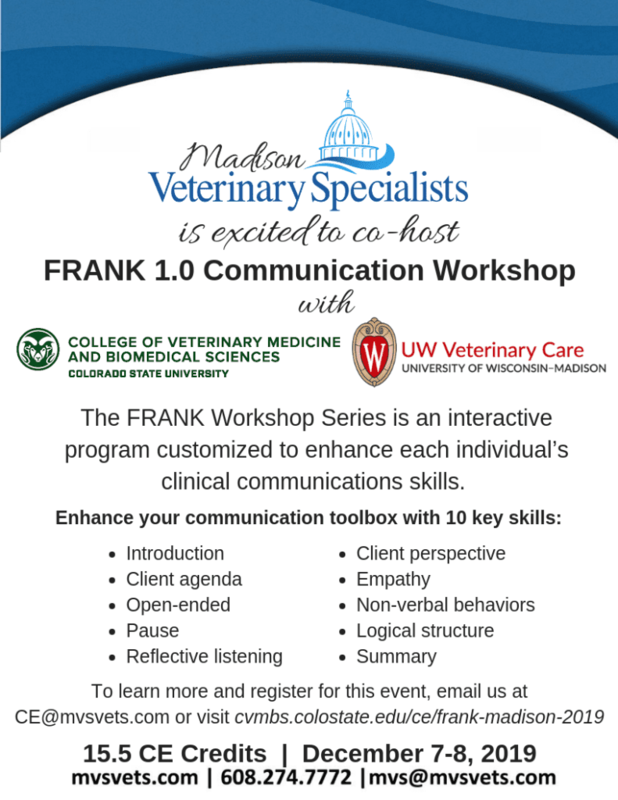 We are excited to bring FRANK communications to Madison! The FRANK Workshop series is a a program developed at Colorado State University that centers around communication with our clients. This workshop will focus on effective use of 10 communication skills to facilitate supportive learning and development of communication skills for veterinary team members, veterinary colleagues, and veterinary students. For more information on FRANK, click here. To register for this event, click here.